Dallas is a northwestern suburb of Atlanta and the county seat of Paulding County. Just 30 minutes from downtown Atlanta, Dallas recently underwent a complete refurbishment of its downtown district in the early 2000s, prompting both CNN and Money Magazine to list the city in the Top 20 Best Places to Live in the United States in 2007. Dallas is a great place to live for walkers, bikers, and hikers, as well as those who prefer the charm and easy-going attitude of simpler times. The population in Dallas consists of 56 percent renters and 44 percent homeowners. The median rent in the city is $955 per month, which is just over the national average of $949. The median home value in Dallas is $134,400, which is substantially lower than the national average ($184,700). The most popular home styles here are the ranch and craftsman. Dallas is a city that enjoys plenty of green spaces thanks to its abundant supply of local parks, and it’s currently one of the more affordable suburbs Atlanta has to offer, which is why Niche calls it one of the Top 50 Best Suburbs to Buy a House in Georgia in 2019. With plenty to see and do, and with its convenient proximity to Atlanta and several other points of interest, Dallas could be just the home base you’ve been looking for. Commuting in and out of Dallas is mostly done by car because the city isn’t served by Atlanta’s MARTA transportation system. It does, however, have several major roadways passing through it or within easy reach, including U.S. Route 278 and State Routes 6, 61, 120, and 381. Walking and bicycling are also great ways to get around and outside of the city with several trails in the area, including the famous Silver Comet Trail, the Dallas Trail Connect, the Sarah Babb Park Biking Trail, and the Mount Tabor Park Mountain Bike Trail. Dallas’s population is largely white (47 percent) and African-American (41 percent), but Hispanics, Asians, and people of two or more races also call it home. The population is female-majority with women outnumbering men 53 percent-to-47 percent. Home to a good public school system, Dallas is a very family-friendly community with children under 10 years old accounting for the largest portion of its population at 19 percent. Adults aged 25-to-34 make up the second-largest segment at 17 percent. With 11 percent of residents aged 65 and over, seniors also enjoy living here. Dallas’s population is well-educated, with 54 percent having attended at some college or at least earned their associate degrees. The median household income in Dallas is $48,920, which is lower than the national average of $55,322. The median individual income is $26,057, compared to $27,419 nationally. Unemployment is lower in Dallas than it is on a national level at 2.4 percent, compared to 3.8 percent nationally. Dallas’s culinary scene largely consists of moderately-priced restaurants and affordable eateries. The excellent menu of down-home specialties at Rodney’s Bar-B-Que makes it one of the most popular places in town. For some of the best Mexican food around, you’ll want to visit La Bamba Mexican Bar & Grill or Totopos Mexican Restaurant. Sal’s Pizza is where to go for pizza, and Mizu Restaurant will cure your cravings for sushi and Asian-fusion dishes. For more affordable eats, try Los Magueys for a quick Mexican meal, Hickory Hut for its American standards, or Pizza Shack for great pizza, calzones and more. Dallas’s nightlife offers a variety of fun ways to spend your after-hours. There’s the cocktail and hookah bar Umbrella Lounge, the Hiram Station Bar & Grill, great beer and burgers at 278 South, and the seafood/cocktail bar SuBourbon Bar & Social Club. Marlene’s is a good old-fashioned neighborhood bar where you’ll feel right at home and unWine’d & Tap in nearby Marietta serves the area’s best wine selection and sensational tapas. Dallas has plenty of things to see and do, and the arts play heavily in the city’s overall culture. The Dallas Theater is a freshly-renovated, old-fashioned theater house where you can catch all manner of live performances through the year. Paulding Fine Arts is a free art and history museum dedicated to preserving the rich culture of Dallas and the rest of Paulding County. 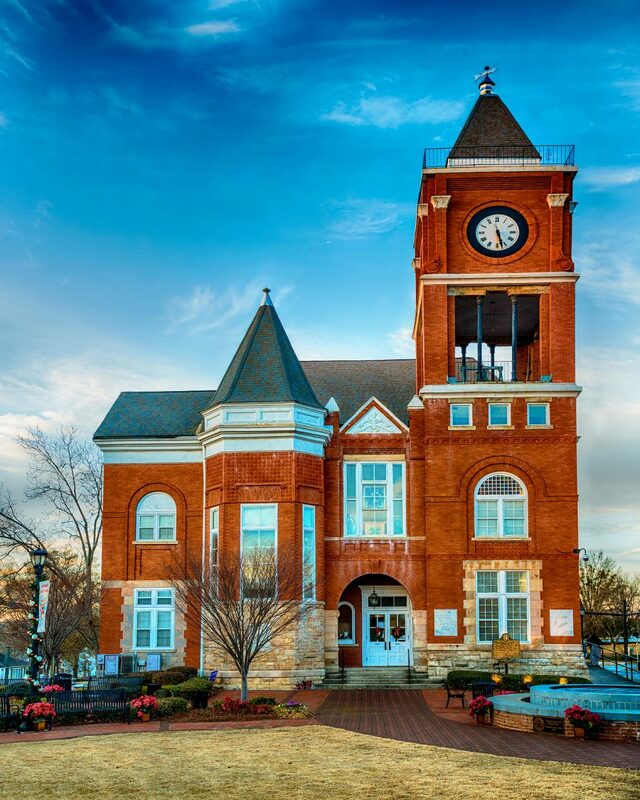 The Paulding County Historical Society and Museum offers even more introspection, with its array of entertaining options and informative collection. Dallas is also home to the Pickett’s Mill Battlefield State Historic Site, where you can go and witness Civil War reenactments and walk the beautiful nature trails. Living in Dallas also places you within a short drive from Pine Mountain Gold Museum at Stockmar Park in Villa Rica, the Southern Museum of Civil War and Locomotive History in Kennesaw, and Etowah Indian Mounds State Park in Carterville, just to name a few of the outstanding selection of attractions in the region. Seniors enjoy a wonderful quality of life in Dallas thanks to the Pauling County Senior/Community Center. Throughout the year, the center hosts fun activities and get-togethers for local seniors to help them stay active and fit. Some of the things the center offers includes jazzercise classes, Chi Kong classes, knitting and crocheting, monthly outings, a meal program and more. Dallas also has good medical services, which is typically very important to seniors. It’s home to WellStar Medical Group, as well as being located just a short drive from Polk Medical Center, WellStar Paulding Hospital, Georgia Cancer Specialists. Want to get FREE, helpful home trends information delivered to your inbox? Sign up today!